Mullacott Farm is a family run farm, with many breeds of livestock, some of them being unusual or rare breeds. If you’d like to bring your family closer to nature on a farm holiday, we’d love to welcome you in. We have a small flock of Polled (hornless) Dorset sheep. We have breeding ewes, a ram and lambs at the right time of year. Throughout the year we raise pigs to supply our Bed and Breakfast and camping accommodation with bacon and sausages. We have kept various breeds, and there should always be some to see here at Mullacott Farm. 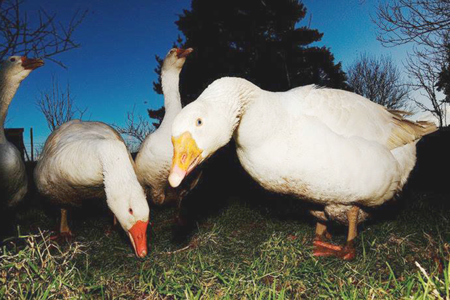 We estimate to have about 100 chicken, ducks geese and guinea fowl too! They all provide us with eggs, which are available from the farmhouse. There are various breeds including Khaki Campbell and Aylesbury Ducks, Warrens, Rhode Island Red, Light Sussex, and Welbar hens. The poultry have livestock guardians living with them in the form of our five Alpacas. These originated from South America, and have incredibly soft fleece. They are very good at chasing away the fox when he comes for a visit. We try and keep the farm as child friendly as we can, as we have children too, but we do ask that visiting children are supervised and dogs are kept on leads - creating a calming environment for a farm holiday in North Devon.